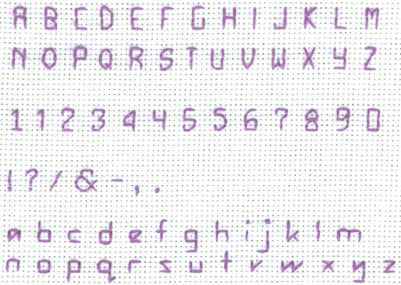 Most of the letters in cross stitch alphabet 02 are one square wide, which makes them perfect for signing your projects with you name or initials. The upper case letters are 2 stitches high. The lower case letters without ascenders or descenders (ex: a, c, o) are 1 stitch high. The lower case letters with only ascenders (ex: b, d, h) or only descenders (ex: g, p, y) are 2 stitches high. The lower case "j", with a descender and a dot above, is 3 stitches high. They are also perfect for text in the Baby Hearts. Learn any unfamiliar stitches by clicking on the links above or the "How To..." button on the left menu of the Home page. Change the floss color to reflect your tastes and to coordinate with the rest of your project. Use the same number of strands that you are using throughout the rest of your cross stitch pattern. To learn how to select and adapt cross stitch alphabets, click on the "Alphabets" button on the left menu. Thoroughly read "The 123's of the Counted Cross Stitch Alphabet" to learn how to select and adapt cross stitch alphabets. Click here for a printable cross stitch pattern for "Mini LIne".